Do you need expert Ramsey concrete curbing service? Call us today at (201) 327-5258 so we can give you a free estimate and provide you with a solution that makes sense. Discover our current specials and coupons when you click here now. Concrete is a material that is made from three main ingredients, which are water, aggregate and cement. The aggregate typically consists of sand, rock or gravel and the cement usually comes in powdered form and acts as a binding agent. Concrete is known as a strong, durable material and it is used for making many different structures, including various types of curbs. Find out what other people in your area are saying about our range of services when you click here now. Concrete curbing refers to the process of using concrete to form curbs for parking lots, landscaping borders and other purposes. It is known for its strength, and although it is often perceived as being gray and dull, there are many decorative concrete styles that work well for creating landscape borders. For landscaping, extruded concrete curbing has the versatility to follow the curves and dips of your specific landscaping. Your contractor can mix the concrete at your home; add colors and patterns to suit your design preferences and then apply as needed. Concrete curbing in your garden will prevent weeds and other unwanted plants from invading your flower beds and causing trouble. If taken care of properly, a concrete border will last for the life of your home. For parking lots, concrete curbs provide strength and barriers that can’t be missed. Most of the time, the decorative colors and styles are necessary, and it is the strength and durability that people are after. This type of curb is ideal for any surface that requires a strong and durable barrier for vehicles, bikes or people. Considering how long they last and how much you will rely on them on a regular basis, using a professional contractor for your concrete curbing needs just makes sense. There are many variables to consider when placing concrete curbs in any location, and it only takes a small miscalculation cause serious problems. 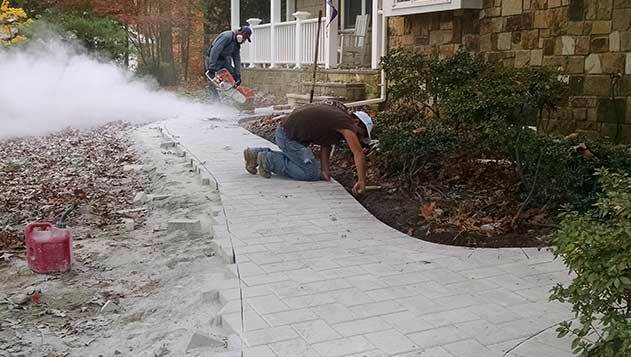 Professional contractors with experience in concrete curbing have the proper equipment and the knowledge required to get the job done quickly and safely. If you need a border that’s strong and will stand the test of time, choose high quality concrete curbing by McFarlane Asphalt. Just call us at (201) 327-5258 in Ramsey, NJ and the surrounding area, so we can assess the situation and provide you with a definitive solution.